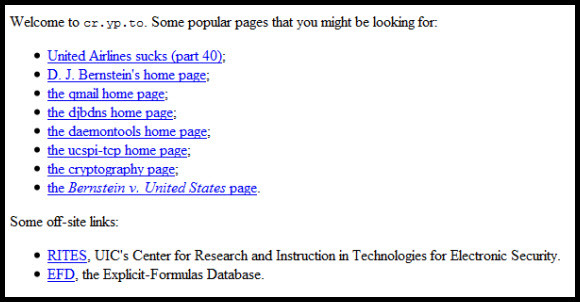 This is a guest post by David Walsh from WebHostingSearch.com. The best domain names have vanished into the interweb’s vortex. People need to be creative. Using country code top-level domains (ccTLD) to create a unique domain is a great way to play on the domain extension and the name itself, also known as a domain hack. Some ccTLDs have lost its original meaning/purpose as they are now frequently used by international companies rather than by the country’s natives. We found ten sites that have been successful in combining their name with a ccTLD. Not all countries allow their ccTLDs to be used by anyone other than their own citizens and domestic companies. Many of the smaller and lesser known countries, however, tend to be quite generous when it comes to selling out their ccTLDs as it can generate a good income for the country. Matt Mullenweg, the creator of WordPress. Being the genius that he is, he came up with the idea to combine the ccTLD of Trinidad & Tobago with “Ma.” And voila, he has a domain name of just his name: Ma.tt. There are no registration restrictions for .tt, with the exception of .edu.tt, .gov.tt, and mil.tt. Physical presence in Trinidad & Tobago is not required to get a .tt domain; making it open for everyone to use. 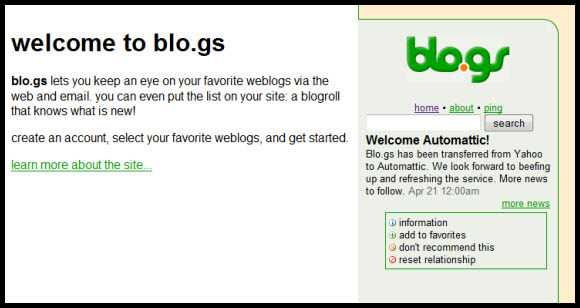 Blo.gs is owned by Automattic and is a site/tool that keeps you updated, via the web and email, when something is happening on your favorite blogs. The ccTLD “gs” belongs to South Georgia and the South Sandwich Islands that are part of the British empire. The .gs domain is often used with no connection to these islands and it is open to international registrants. Go to their official domain registration website (www.nic.gs) if you want to get a registered domain, since buying .gs is unavailable at the most popular domain companies (e.g. godaddy). While .mp is the official ccTLD for the Northern Mariana Islands you will not really be able to find many websites with this suffix that are related to this tiny country. 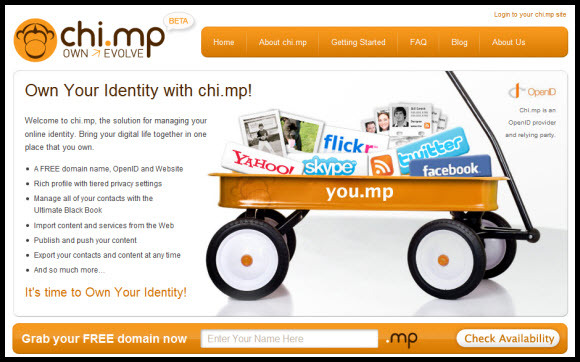 Chi.mp is the most popular .mp, and is a content hub and identity management platform. Through them, you can obtain your own .mp domain. A .mp domain currently costs $20 per year, but if host it on Chi.mp’s own platform it’s free. There are no restrictions when it comes to registrations. The ccTLD .nu is a very popular domain prefix in Sweden, Denmark and the Netherlands since “nu” means “now” in the local languages. 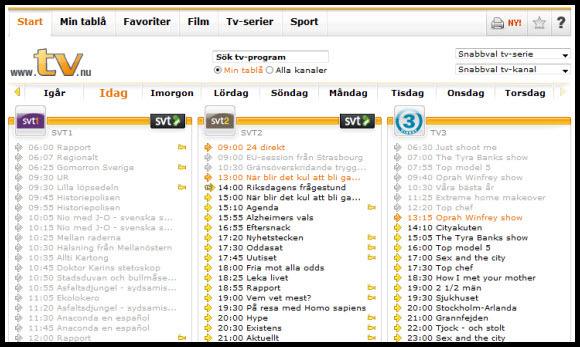 The Swedish site tv.nu (translated as tv.now) is just one of many .nu sites in Scandinavia. Originally it was the assigned ccTLD for the island state of Niue and it is one of the first ccTLDs that was offered as an alternative to the common .com and .net. Check out nunames.nu if you want to get your very own .nu. What do most people think about when they hear the word TV? Probably entertainment, video, and audio. 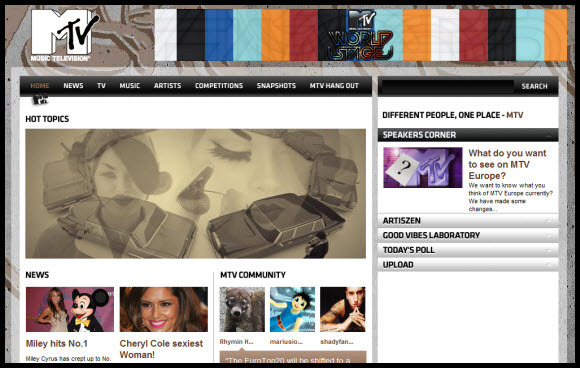 The ccTLD .tv is the perfect match for sites such as MTV, VH1 and the like. Tuvalu was the intended country for this ccTLD but is now open for registration all over the world. 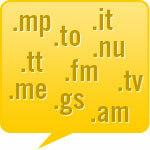 If you want a .tv domain, you can visit www.verisign.tv and check the availability of these domain names. The .me ccTLD has, for obvious reasons, become very popular in English-speaking countries. 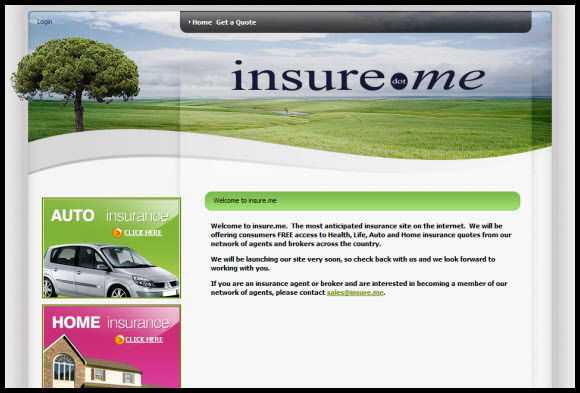 It is marketed for personal websites. Last summer Montenegro (that little country where Bond’s Casino Royale took place), opened up registration of .me to the public. All of the cool and not-PG friendly .me are gone now, but the ability to create salacious names are never ending. If you want to buy a .me domain, go to doMEn (domain.me). The ccTLD .to of Tonga is open for registration, without restriction as well. The famed programmer, mathematician and cryptologist Daniel Bernstein has registered the domain hack cr.yp.to as his own personal website. Visit the Tonga Network Information Center (www.tonic.to) if you wish to register a site with a .to domain name. Armenia is the country with the ccTLD .am but its friendly spelling has allowed it to become popular among radio shows and the AM networks. The prefix is still widely used in Armenia but it is being marketed as an international domain. There are no real restrictions when it comes to registering an .am domain name but the registry reserves the right to revoke registrations in case of obscenity or illegal activities. 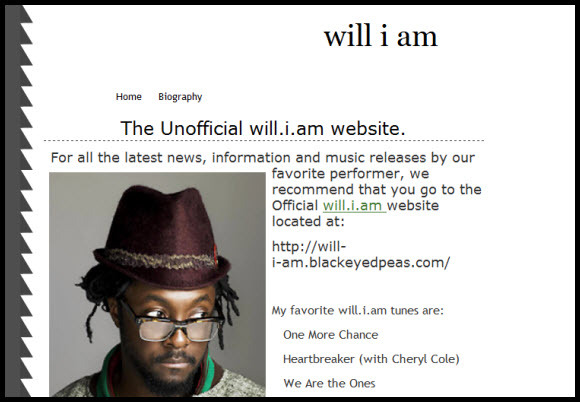 Above you see an example where some Will.I.Am fans became creative and registered the fan site will.i.am. The Federated States of Micronesia, an island nation located in the Pacific Ocean, owns the ccTLD .fm. The top level domain is however not particularly related to Micronesia and it has instead become widely connected to the FM radio networks. It is open globally and there are no restrictions for people wanting to register a .fm domain name. 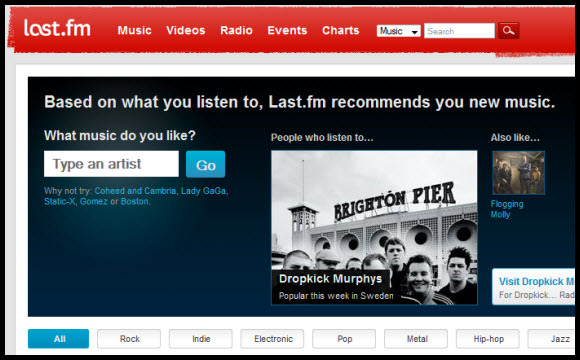 One of the most well-known examples is the above listed social music website last.fm. Go to www.dot.fm to register a good domain name. Many English words go well with the Italian ccTLD since it spells “it.” .IT is still very popular in its homeland and the most common of all these ccTLDs to be used by the native country. If you want an .it domain you will have to be a resident of an EU country and the registration request has to be sent in Italian, via paper or fax letter to the registrar. A little archaic, but hey it is Italy. Also, the domain name itself has to consist of at least three characters. 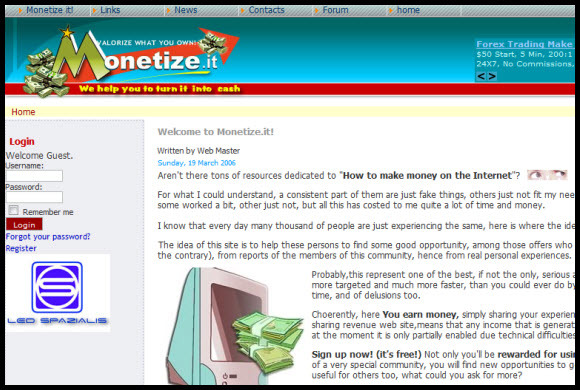 Monetize.it is a good domain hack (even though the site is not all that beautiful). 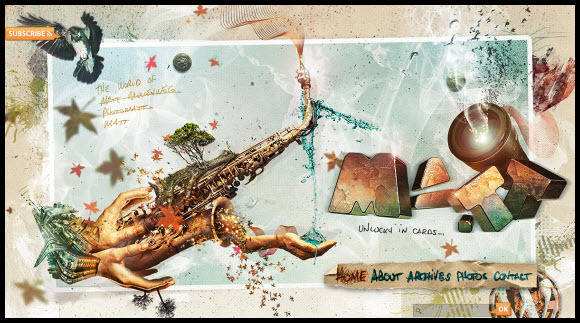 Go to this site (www.nic.it) if you wish to read more and want to register a domain name. And you thought your favorite domain name was taken by some spammer? Here you have more options to find a creative and awesome domain. If these ten names do not satisfy your thirst, there is also: Iceland (.is), Antigua and Barbuda (.ag), and the United States (.us). About the author: David Walsh is an editor, music lover, and hosting geek at WebHostingSearch.com. Ever since he registered his first domain name he has been interested in coming up with creative ways of using ccTLDs. Visit his site Web Hosting Search to read more on his favorite topic, well: web hosting. Thanks for including .mp in your list! To clarify, a .mp domain that uses the chi.mp hosted application is free of charge for personal use. If you want to delegate your domain to another service then you will have to pay the $20/year fee. You can convert a chi.mp domain to a paid domain at any time if you decide that you don’t like or need the chi.mp service or if you want to use the domain for commercial purposes. British *Empire*?? I don’t think we’ve had an empire for quite some time. The Sandwich Isles are a dependent overseas territory, I believe. @Robert Accettura and redwall_hp: Automattic indeed now handles the blo.gs domain as you point out, but that happened very recently. David wrote this text just before the switch took place. We’ll make a note of it in the post (and if you look carefully at the screenshot, taken later, you’ll see Automattic mentioned). Ma.tt is a seriously beautiful blog. Great design! I guess if you’re the man behind WP, you have a reputation to think of. I like, I like. 🙂 Awesome domain too. also check out http://domai.nr which automates variation lookups and helps with brainstorming your next domain with a cctld. I made an article summary wiki called Synopit and was able to get http://synop.it using the Italian TLD. You forgot .in though. Also open worldwide and a word. Tons of hacks of words ending with “in” as well as sub hacks like surfs.in etc.